Artist Spotlight is a monthly highlight of the work, process and artists featured in the Office of Cultural Affair’s Public Art Registry. The Public Art Atlanta National Registry serves as the preferred list for soliciting artists for major and minor public art commissions and direct purchases of artworks for the City of Atlanta, while also serving as a qualified professional Public Artist list for additional commissioning agencies. Currently the Registry boasts full portfolios and resumes of over 300 professional public artists and is dedicated to expanding the scope of public artwork in Atlanta. Pam Longobardi was born in Glen Ridge, N.J., the daughter of an ocean lifeguard and the Delaware State diving champion. She has since lived for varying time periods in Wyoming, Montana, California and Tennessee, and worked as a firefighter and tree planter, a scientific illustrator and aerial mapmaker, a waitress and a bartender, a collaborative printer and a color mixer. She has shown her artwork across the US and in Finland, Slovakia, China, Japan, Spain, Belgium, Poland, Germany, and Monaco and her artworks are in numerous collections both public and private. 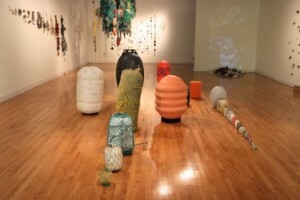 A recipient of many awards, Longobardi is Professor of Art at Georgia State University in Atlanta and created the Drifters Project in 2006, a conceptually-based artistic research project focusing on the global ocean marker of contemporary archeology, the drifting plastic object. 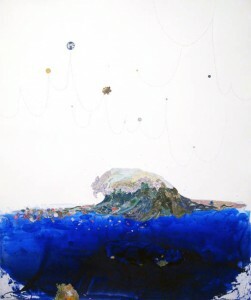 She exhibited this work in Beijing at NY ARTS/Beijing (2008 Olympics) and at ARTLIFEfortheworld in (2009 Venice Biennale ARTE VISIVI collateral exhibitions). 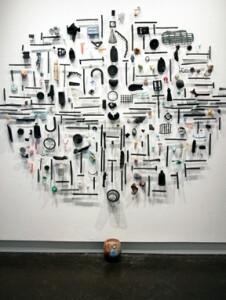 Edizione Charta (Milan, NY) published a book on the project titled Drifters: Plastics, Pollution and Personhood in 2010. Recent past exhibitions include Voyages on an Uncanny Sea at Gallery Diet in Miami, a commission of new work for Oceanomania at the Nouveau Musée National de Monaco, and at Savvy Contemporary in Berlin. She is engaged in a long-term project in Greece in collaboration with the Ionion Center for Art and Culture in Kefalonia, having completed its 4th year. Longobardi participated in the 2013 GYRE expedition, an art-science research project along Alaska’s remote coasts culminating in the 2014 GYRE exhibition at the Anchorage Museum and traveling to the CDC Museum in Atlanta in 2015, and was also featured in the National Geographic film on the GYRE project. She created an installation for the Island of San Francisco of the Desert in a special project Oltre il Paesaggio Mistico for the 55th Venice Biennale, and exhibited photography in Seescape at George Adams Gallery in New York. In 2013, Longobardi won the prestigious Hudgens Prize, one of the largest prizes to an artist in North America. She was recently featured on the cover of SIERRA magazine, on the Weather Channel and was selected for ‘State of the Art’ a survey of American art now at the Crystal Bridges Museum of American Art. She will exhibit the long-term project on Kefalonia at the Goulandris Museum of Natural History in Athens, Greece from May to November 2015. Let’s start off with who you are and what type of work do you do? I have both a studio-based practice and an artistic research project. My work takes many forms from paintings and works on paper to large-scale sculptures and installations. Most recently my work has taken on a form of social practice. Its is both local and widely international: I currently have active projects in Greece, Costa Rica, Bali and beginning a new site in Belize this summer. Can you tell us a little about the Drifters project and how it got started? I stumbled upon mountainous plastic vomited out of the ocean on a very remote part of Hawaii in 2006. Feeling like I was entering a crime scene, I immediately began documenting the sites photographically, then pursuing a kind of forensic beach cleaning. This has become a global project, engaging hundreds and hundreds of people and removing thousands and thousands of pounds of plastic from the natural environment and resituating it in exhibition context for witness and contemplation. I can imagine you having a very huge reserve of gathered materials collected from your all of journeys to make your work from. How do you initially tackle the creation of your installation works? Do you know right away which items you would like to incorporate into your environments? I have a massive archive of materials from all over the world, tagged and labeled with date, location and conditions of site. Some of these materials I consider ‘evidence’ and have these in permanent archive, and others are simply raw material that I make the work out of. When beginning an installation, I always begin with a conceptual idea, I am first and foremost a conceptual artist who makes things to communicate ideas. Then I go through a long process of rooting around in the material, moving things, changing them, finally building them. I generally do have a color idea about a piece right from the start that guides the choices. You just hosted the Plastic Gyre symposium at Georgia State University in March. This type of conversation was unprecedented and cross-sectioned the arts, sciences and cultural activism. It also gave a large number of people a much needed introduction to the arrival of the Anthropocene and questions of human evolution. Tell us a little about what this project meant for you on a whole and what you believe will be the outcome of this event and others like it in the future? There was an amazing thing that happened with that symposium. In some ways it was one of the most involved and difficult thing I have undertaken. There were over 35 prestigious speakers, hundreds of participants, a huge amount of very generous and wonderful sponsors that we gathered, and an overwhelming victory at the end of it. One artist I really admire said it was my largest work of social art. To me, that was what it felt like, and I was incredibly honored by this acknowledgement. The difficulty was in the complexity of it, involving 2 big institutions, GSU and the CDC, and it was all coming together around the backdrop of the insane Senate Bill 139, ‘The Plastic Bag Ban Ban,’ a bill coming for vote in the House (already passing the Senate) to make it illegal to create a plastic ban or tax of any kind in the state of Georgia. That is, to me, an infringement on our civil rights. I was working behind the scenes with some people and we were able to get a proclamation from Honorable Councilman Kwanza Hall declaring Mar 27 PLASTIC REDUCTION ATLANTA DAY. I drafted the text, which was adapted somewhat in the official document, but its quite amazing, and it was delivered by Councilman Hall on the morning of Mar 27 at the CDC Museum in a press conference. As luck would have it, this was also the very day that the SB 139 was coming up for a vote in the house. This bill was created by pressure of lobbyists for the American Chemistry Council, which is the plastic lobby and which is every bit as powerful as the oil lobby and makes tremendous amounts of money from the plastics that make us sick, kill countless ocean creatures and despoil the earth. They had sent down 20 of their lobbyists from Washington DC because the bill was expected to pass in GA, Florida already has passed this same bill into law, and Arizona just did it too. So while we stalled the beginning of the final panel, on Social Justice, because several of the panelists were down at the capital because the bill was being voted on right at that moment and there was mad lobbying going on. I was revving up the audience to send positive waves of energy over to the capital. We started getting frantic text updates from the chamber, and just as we began the panel we got the text, “WE WON!!! !” The bill had been defeated! The entire room broke out in cheers, tears, jumping and hugging. It was just incredible. I still get chills when I think about it. It couldn’t have been scripted better in a Hollywood film. It felt like a kind of transformative art performance. No one there will ever forget it. And it made me really proud of Atlanta. In what ways have you seen Atlanta and the South become more open to conversations centered on practices in environmental sustainability? In major ways. I have worked with these ideas in my art for decades, and it only became more specific with the Drifters Project, and while I have been lucky in my career, I think for years, people weren’t ready for that work here. When I won the Hudgens Prize, I really felt like my ideas that form the basis for my work time had come. It was an incredible acknowledgement, and many many more good things have followed. That makes me feel really hopeful, and it helps in making this work which is really really difficult to do. Also, see above. That was a HUGE moment for Atlanta. And I am happy to say that Stephanie Stuckey-Benfield, the Director of Greenlaw, an amazing group of environmental lawyers in Atlanta, has just been named the Director for the Office of Sustainability for the City of Atlanta. She was the moderator for the Social Justice panel of the GYRE symposium that day, and she was one of the major reasons that bill was defeated. Its an extraordinary development for our city. In which ways do you believe the public has an impact on your work? The public has a major impact on my work because without the public, the art doesn’t exist. It doesn’t live in a vacuum of the studio. It exists in the world, it becomes alive out in the larger social sphere. My personal practice, either the private moments solving a painting or the amazing experiences I have had in nature in a very mystical communication with a larger consciousness is the essential core to my practice that I cannot live without. But the weird wildness of the outer world, outside the studio, is where I take the greatest risks, and this is what the art cannot live without. For a long time, it only made sense to a few people. But now it seems to make sense to very many people, and that’s because I think we as humans are changing. We see the precariousness of our position, and more and more people are being moved to do something about it. What other projects or exhibitions do you have planned in the coming year that you are really excited about? Two exciting things this summer. One is a major show in Athens Greece at the Goulandris Museum of Natural History, which is also home to the Gaia Center. It’s a fantastic museum in the center of Athens, and they are devoting a whole 7-month exhibition to the work I have been doing in Greece for the past 5 years, along with Dianna Cohen who joined the project in its 2nd year. I was able to bring six students from GSU to work with us on last summer and we created a very large public sculptural piece last summer that will be exhibited, along with installations I will construct from materials I have recovered from giant sea caves there, and a series of photographs by other artists we invited that dealing with ocean plastic in different ways. It will be the centerpiece for a large marine symposium the museum is organizing to accompany it. Then, later in the summer, I will go to Belize with my assistant Susan Knippenberg, and an Emory graduate student I have been working with Paulita Bennet-Martin, and we will work in Belize. Paulita is originally from there, and she is has been doing a scientific study on plastic there. We will bring the Drifters Project there, and do some large-scale site pieces, and I will do a show at one of the local museums creating a plastic ‘intervention’ by inserting my collected plastic objects into their collection of artifacts. I’m really excited – it’s an entirely new beach and culture to work within.